Ah, Christmas…the most wonderful time of the year. All is calm, all is bright — until you are scrambling at the very last second to decorate your house and serve wonderful food to your hungry Christmas party guests. Why not kill two birds with one stone? 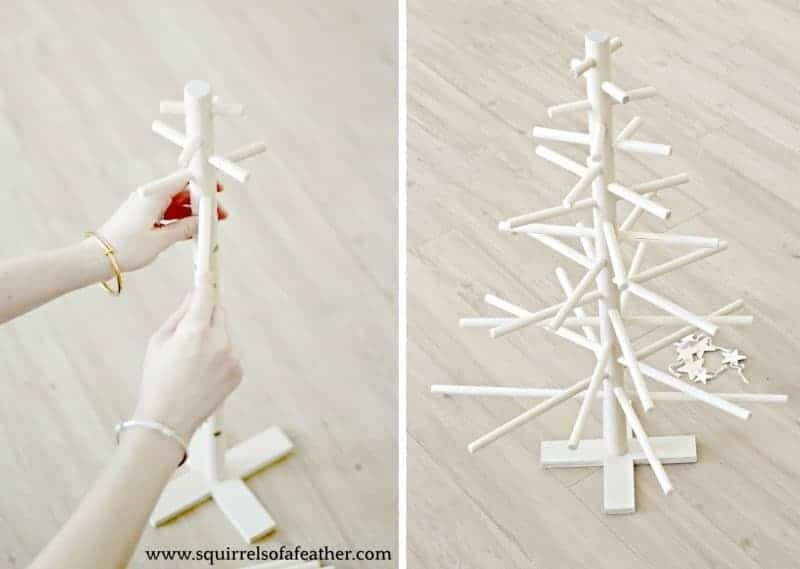 This minimalist Christmas wooden dowel tree is easy to assemble and features edible ornaments that are sure to be a sensation! 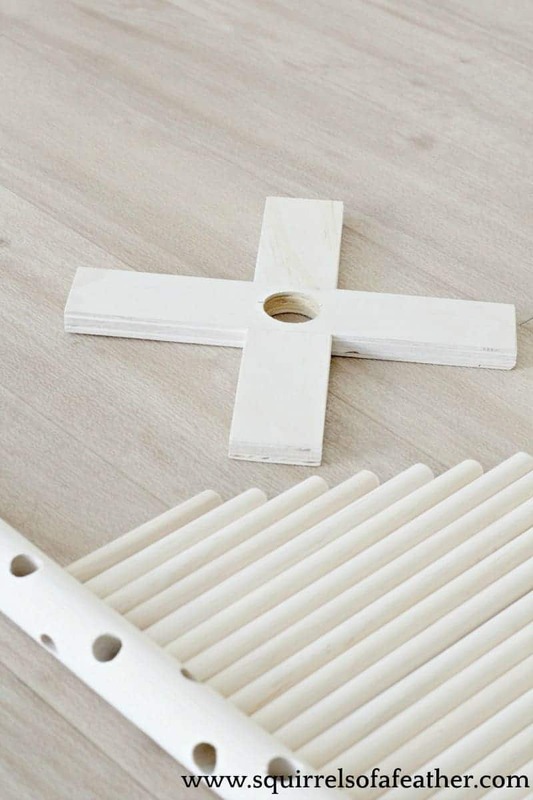 Decorate your house and feed your guests all at once with this clever take on a Scandinavian-style minimalist wooden dowel Christmas tree. It beats those tired old charcuterie boards any day! 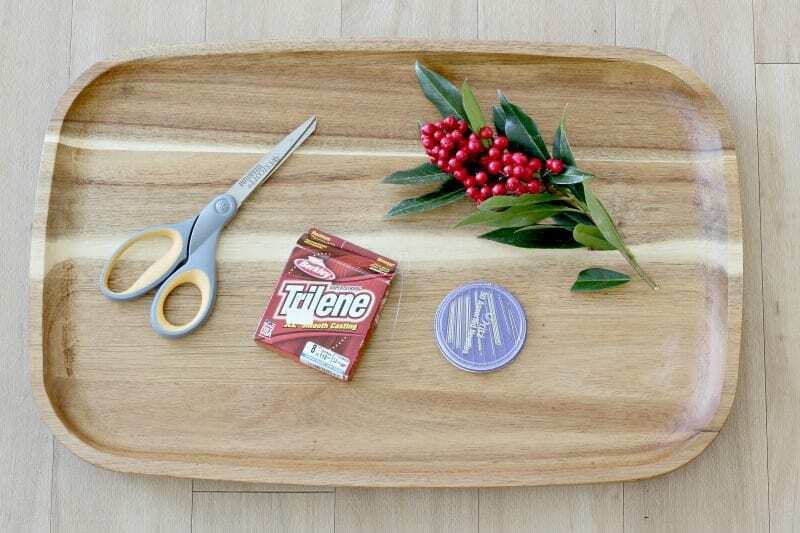 Bored with ho-hum party food trays for holidays? Serve up your guests snacks and appetizers as they’ve never seen them before with this wooden dowel Christmas tree, complete with edible ornaments. The idea for this wooden dowel tree came up in a conversation between my friend, Laura from Little Yellow Wheelbarrow, and I. Just like the Sawyer Brown song, I got to give credit where credit is due, so thanks to Laura for being my muse (and what an a-musing muse she is folks! 😉 ). 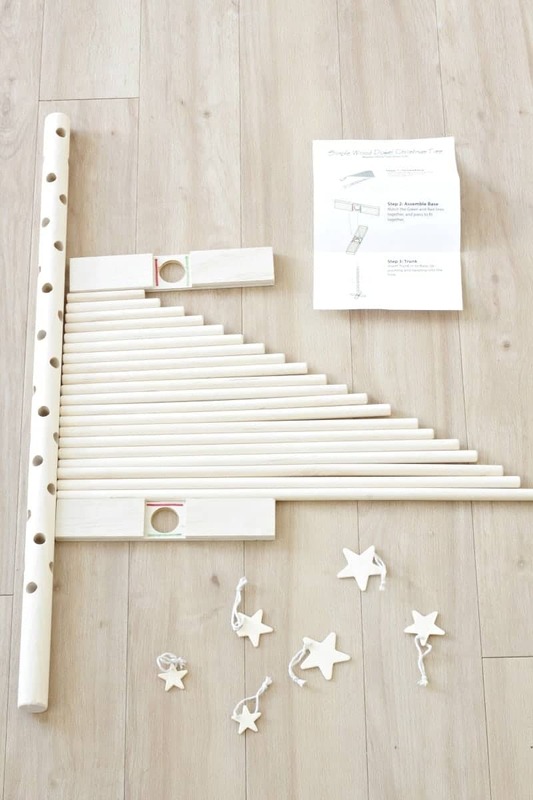 If you aren’t very handy, this easy wooden dowel tree is the wooden Christmas tree for you! It comes with all the holes and do-hickeys ready to assemble and takes less than five minutes to set up. My wooden tree came from this Etsy shop. The seller was fantastic about answering all my questions. I almost didn’t order it because I wasn’t sure there would be enough time to get it before Christmas and share this post with you, but she reassured me that it would arrive with plenty of time left for me to share by my deadline. Oh boy, it sure did arrive on time! To my LOCKED townhouse community office, nicely out of reach for days during their unexpected closure. Happily, the office opened, I got the holly jolly tree out, and now I can present you with this playfully modern take on serving up some holiday cheer via dangling edible ornaments. 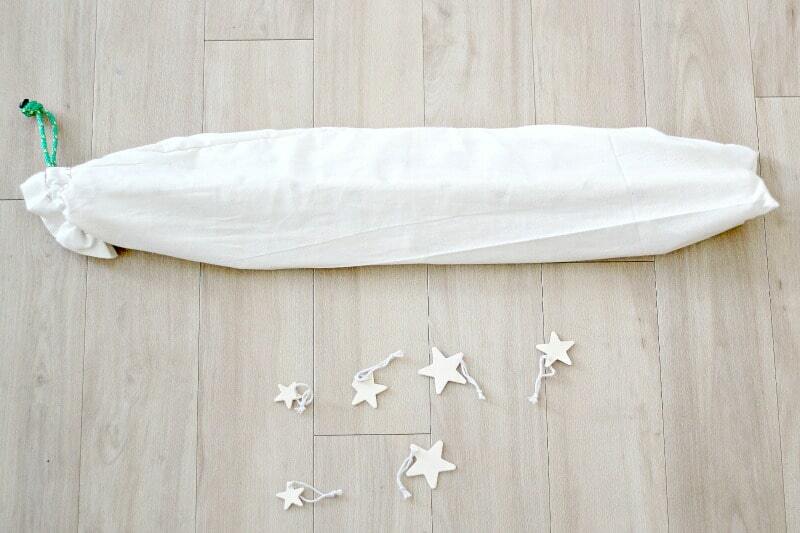 This wooden dowel tree came in an adorable canvas bag, complete with cheery Christmas card and five tiny wooden stars. Like I said, assembling this Scandinavian-style beauty is a piece of cake. It comes with instructions but you practically don’t need them — I bet my five-year-old could do this easily. Take all of the pieces out and carefully place them on the floor. Make sure you find all the pieces and don’t miss any. Arrange the “branch” rods from small to large on the floor. It helps if you press one of the ends against the large wooden “trunk” part of the tree. No two sizes are the same; each one will be larger than the next, and so on. Take both of the rectangular wooden standing frame pieces and push them together, cut side in. This will keep the stand locked in place; there is a hole at the bottom which the trunk will fit through. Now, take the longest dowel, the one with the holes in it, and place it into the wooden stand. Push down firmly, twisting gently if needed, to get the trunk to stay firmly in place. Once you have the dowel tree trunk in place you are ready to add the branches. Start with the smallest, and place that at the very top. Then work down, moving from smallest at the top to the largest at the bottom. Don’t get them mixed up when you are sorting. I noticed when I was grabbing them I missed a hole and I had to pull a bunch out and redo from the middle. Continue adding all the branches until all have been placed. Then, it’s time to decorate your tree! Once you are ready to decorate your Christmas tree with edible ornaments, you simply need to thread them with either cotton twine or fishing line. The size of the thread will be determined by the types of food you decide to hang on the dowel Christmas tree. I used fishing line for this tree, but cotton twine would also look amazing if you have foods with larger holes! You can see how I threaded the pretzel onto the fishing line, which I then snipped and tied off. I tied the fishing line by grabbing both end threads and tying in a knot. Don’t leave too much space or your food will be hitting the branch below it. Don’t feel limited to making only dangling ornaments either! If the cookies you chose have large enough holes, for example, you could simply slide them onto the tree branches several at a time. Marshmallow and popcorn could also be threaded on fishing line or thread as an edible garland. IKEA Hack: Turn Nesting Baskets Into an Adorable Snowman! 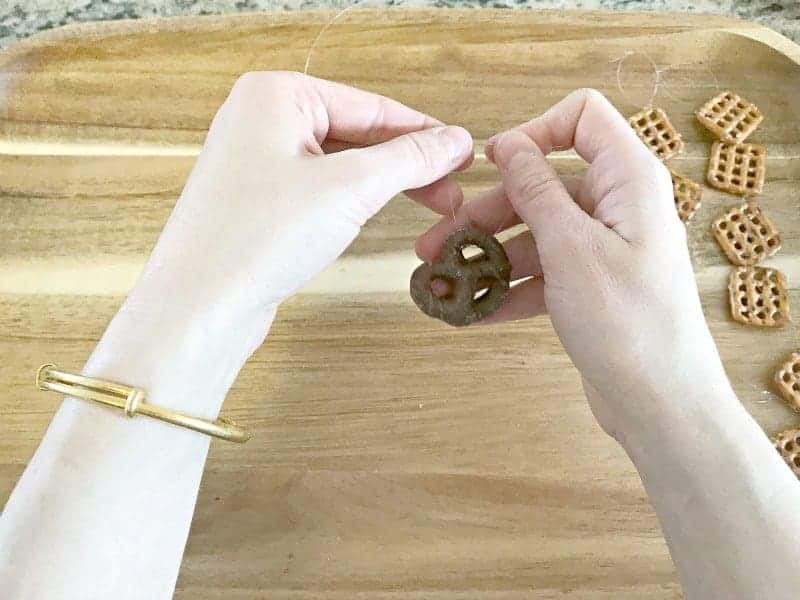 I hope you enjoyed this post with ideas on how to serve edible ornaments on your wooden dowel tree for Christmas! If you have any questions leave them in the comment section below. Any awesome food ideas that I overlooked? Add those as well and they could end up in this post! What a great idea, so much fun for a dinner party centerpiece for a kids table. Thanks Sue, I’m all about the fun! Very clever idea! I love it, and now I’m hungry! 😂 Gotta get one of those trees! He would have a tummyache! Hahaha, I bet the boys and he would love to chow down on this together. Oh my goodness this is so cute! Seriously I have been wanting a dowel tree and now I know where to get one and a great way to decorate too. Yes, great place to get dowel tree, love mine so much! Love the edible decorating idea. So great for a Christmas party! This is the cutest and most unique idea Marissa and I love that little wooden tree. Thanks for sharing. You did amazing on these! Kids would eat these up and they look perfect.Lovely tree decoration with snacks. Thanks so much! My kids definitely had a lot of fun with the “eating” part!